Metabarcoding, a technique of mass DNA sequencing, allows for tracing migratory routes of insects, an understudied subject due to technical limitations. A small DNA fragment of the pollen that insects transport is used as a barcode to identify the plant species they visited previously. This British Ecological Society funded study shows that transcontinental pollination mediated by migrating insects is possible and, therefore, various plants located very far apart can mix. The migration of insects is a natural phenomenon as important as it is unknown. In fact, it has only been studied in depth in some emblematic species, such as the migratory locust and the monarch butterfly. The reasons, in short, are the technical limitations to study this behaviour. Now, in a study published in the journal Molecular Ecology Resources, researchers from Institut de Biologia Evolutiva (IBE: CSIC – Universitat Pompeu Fabra), Institute of Botany of the Polish Academy of Sciences and Universitat Autònoma de Barcelona (UAB), have developed a technique that eludes these limitations and therefore allows to easily study the migratory movements of insects: the DNA metabarcoding analysis of the pollen transported by insects. By means of this technique, a small DNA fragment can identify the plant species to which the pollen belongs to, analogously to a barcode. By knowing the geographic distribution of the plant species detected, we can infer the place where the insect was feeding and, therefore, its migratory route. Previously, long-distance migrations were studied either by capture-mark-recapture experiments, or through telemetry using radio trackers. These two methods, however, have great disadvantages: the recapture rate of marked individuals is extremely low; as for telemetry, it is only feasible to track the largest insects over short distances, given the weight of the transmitters and their short battery life. Another method to study long-distance migrations involves analysing hydrogen or carbon isotopes present in organic tissues, because they provide information about where the insects were born. However, the resolution of isotope analyses is low and this method is only useful for insects that migrate on very large distances. When insects feed on the flowers, pollen is deposited on their bodies and can be transported over long distances. Taxonomical classification of the pollen grains using optical and electron microscopy, however, is often impossible at species level. In addition, it requires a great investment of time and having specialized knowledge in taxonomy, which is why this is an unsuitable tool for large-scale studies. However, as explained by Roger Vila, one of the authors of the study and principal investigator at IBE, «the development of next-generation sequencing technologies has made it possible to massively sequence the genetic material present in a sample of pollen from various individuals». This is the metabarcoding technique, in which the species are identified from a small region of the DNA that performs a function analogous to that of a barcode. 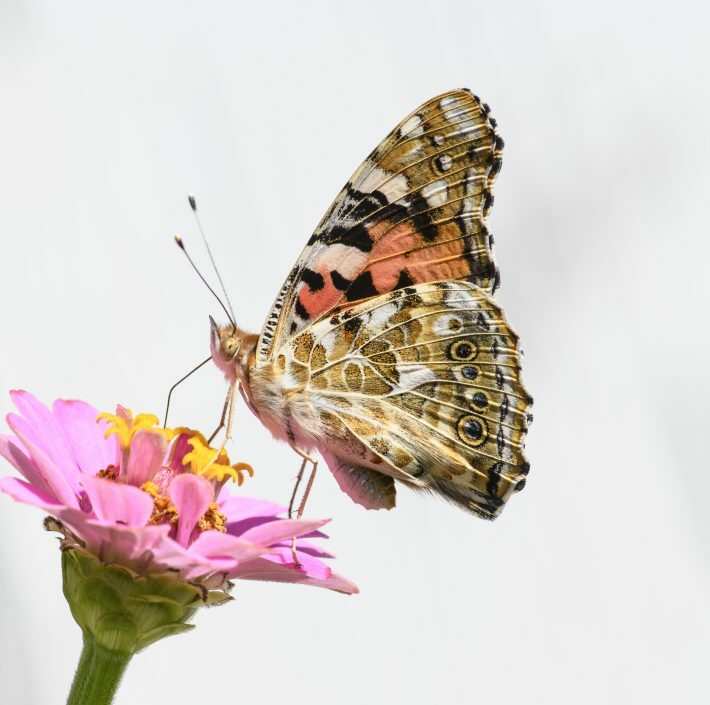 The researchers used the metabarcoding technique to study the pollen from 47 specimens of migrating painted lady butterflies (Vanessa cardui), which have been captured on the Spanish Mediterranean coast during spring. The objective was to test if the sequences obtained were from endemic African plant species and to shed light on the migratory circuits of these butterflies. The analysis revealed pollen of 157 species of plants of 23 different orders; the vast majority were, indeed, African and not present in Europe. The painted lady has recently been shown to be the butterfly species that performs the longest migrations in the world, traveling every year between tropical Africa and Europe (back and forth, crossing the Sahara desert) in successive generations, although the precise routes are still unknown. The project was funded by the National Geographic Society, the British Ecological Society, the European Community and the Spanish Ministerio de Ciencia, Innovación y Universidades.